Please extract the file and install the software using your existing licence number (usually identified automatically). Earlier versions don’t have to be uninstalled. Chargeable upgrades will be displayed at the online shop when you log in with your WUFI® account. 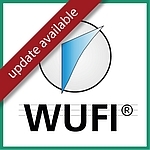 When buying a new license of WUFI®, you will directly receive the latest version.